Finding the best retractable banner stand to fit your retail store needs can be a difficult challenge, especially with so many different options on the market. Don’t worry, you can find exactly what you need from 40 Visuals. The guide below highlights key features for each of the banner stands we carry, so you can know exactly which one is right for you. All banner stands from 40 visuals include a Stay-Flat printed graphic. This is the most economical retractable banner stand on the market. The London Retractable Banner measures in at 24 inches wide, making it the perfect size to get the desired impact where space is limited. 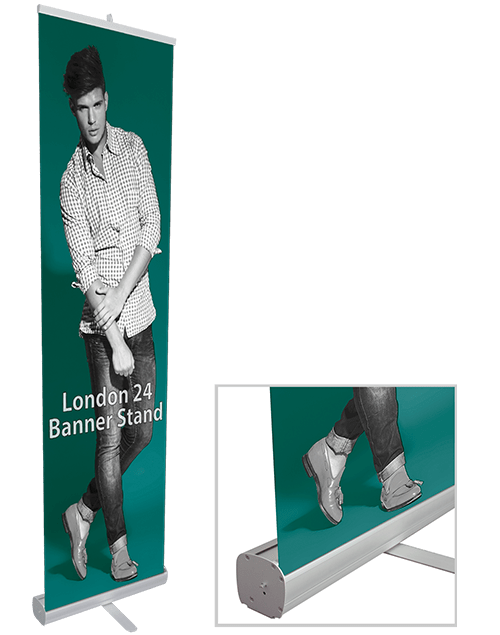 Extremely portable, the versatility of the London 24 Banner stand is second to none. The London 33 Banner Stand features a durable aluminum construction with a silver finish. This durable 33”w stand is perfect for easy storage, as the pole and banner fold down directly into the base. A carrying bag is provided to make for easy transportation. The retractable Houston Elite Stand does not have feet that stick out, but instead has a heavy duty aluminum base. The base gives this banner stand a sophisticated, streamlined look with its anodized silver molded end plates and adjustable pole. 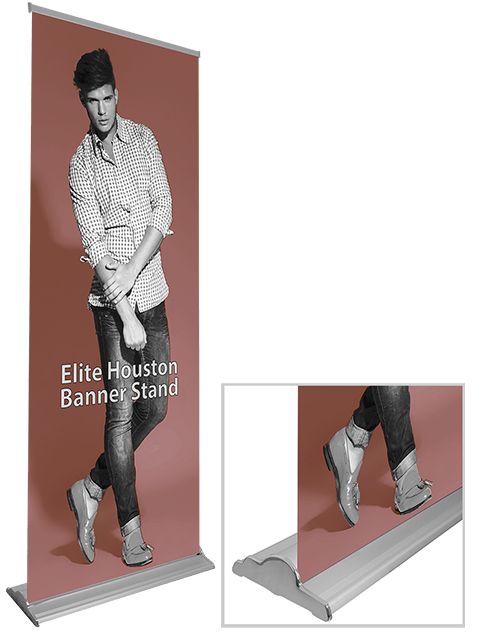 The Houston Elite Banner Stand is 33″ wide, making it easy to take anywhere with the canvas carrying case, which is provided along with the banner stand. This larger than life banner stand measures in at 47.25”w x 83.5”h. 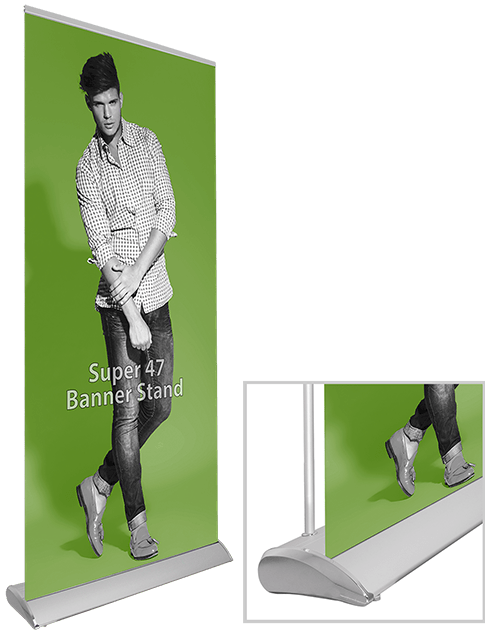 At this size the Super Banner Stand will let your artwork shine and get the attention it deserves. The Super Banner Stand comes with a canvas carrying case and the base can be recycled. 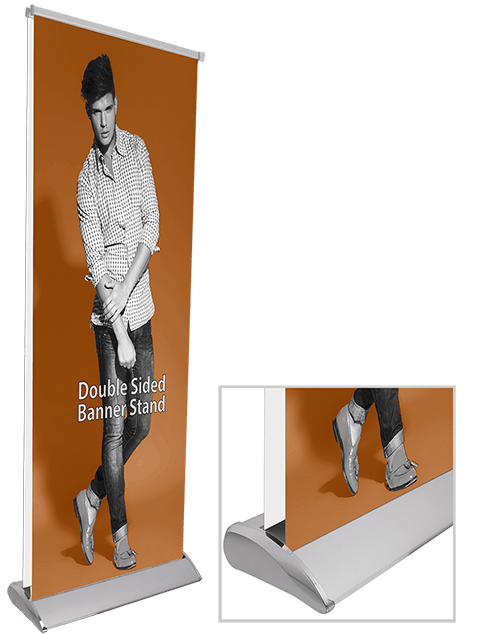 Our double sided banner stand provides twice the impact of the normal single sided banner stands. A heavy duty base provides a sturdy, yet sleek looking base. The graphics feature our anti-curl polyfilm to keep your graphics looking their best. 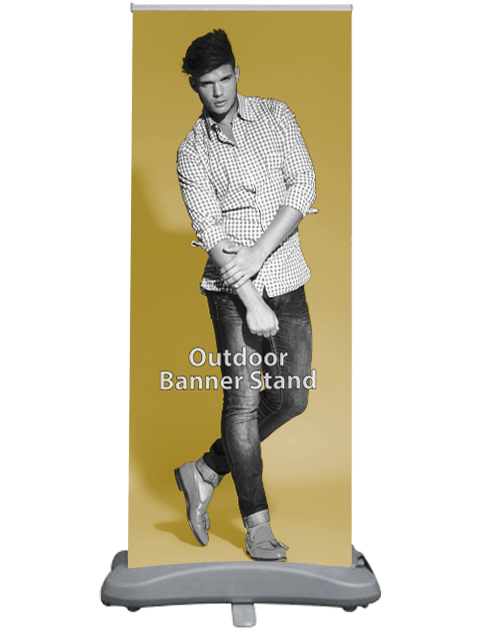 Just like the Outdoor Double Sided Banner Stand, this banner stand includes anodized silver finish, molded end plates, 3 piece bungee corded poles and a canvas carrying case. The Outdoor Banner Stand provides double the impact while being durable enough to handle adverse weather other banner stands can’t. Its base is heavy duty to keep it from blowing away, while still providing a sharp, classy look. Using an anti-curl banner media ensures that your graphics will always look their best. The double sided banner stand comes with anodized silver finish, molded end plates, 3 piece bungee corded poles and a canvas carrying case. 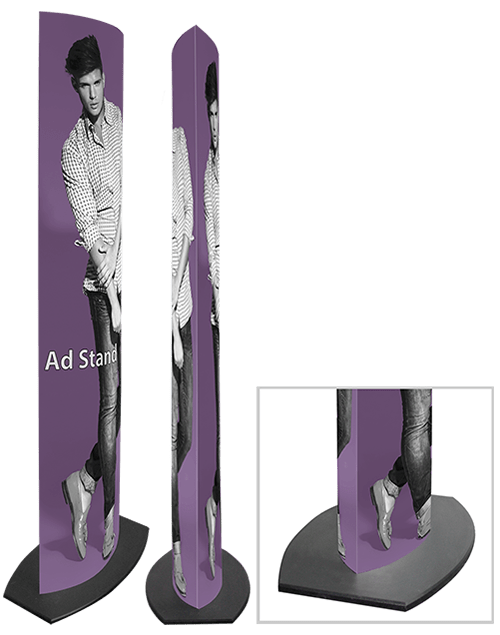 The Double Sided Ad Tower‘s double sided exposure and eye-level height make it a unique tool to promote your brand. It is lightweight and easy to set up. The elegant, oval shaped base is sturdy and is perfect for in-store use and at trade shows. The Double Sided Ad Tower allows for the ad sleeves to be replaced with a new image, so you don’t have to purchase a whole new Ad Tower system. 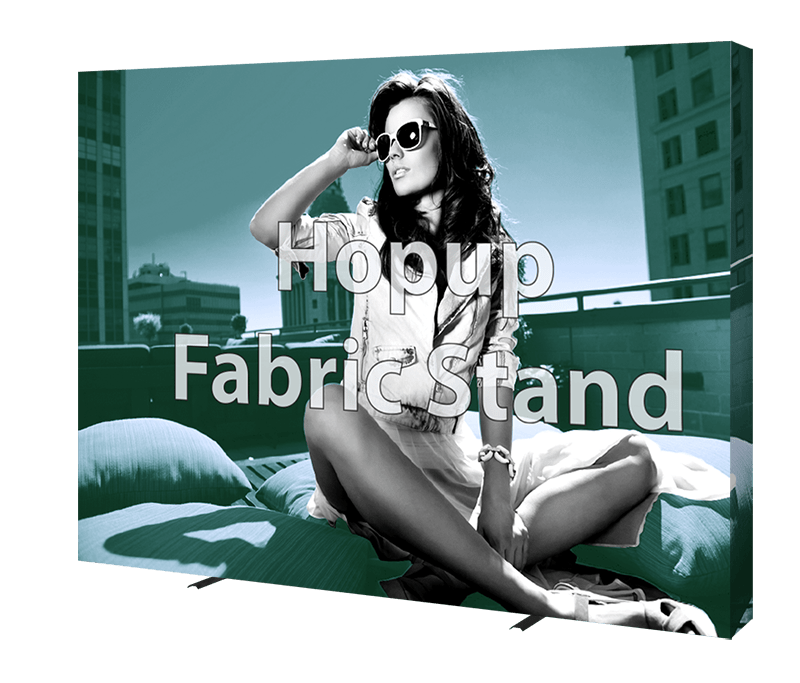 All our Hopup Stands are made out of a lightweight anodized silver frame that is convenient, yet effective at creating a backdrop for special events. Assembly is exceptionally easy and can be done within minutes, by simply attaching the stretch fabric graphic to velcro and expand. Comes in both classic straight or a curved frame for a unique look. Each kit includes rolling carry bag for travel. If you aren’t sure which one is the right one for you give us a call at 800-962-3119 and one of our dedicated staff will help you in choosing the right banner stand for you.